Mosquito Experts Put Forth An Immodest Proposal For To Eliminate Disease-Carrying Aedes Aegypti : Goats and Soda You'd need a mosquito czar, worldwide cooperation, millions of dollars and the hope that the technology works out. Good luck! Just how, exactly, could we wipe out a species of mosquito? That's the question some of our readers wanted to know after reading our story that pondered the fate of the mosquito that carries the Zika virus, the Aedes aegypti. Would attempting to eliminate them be a good thing, or would it somehow backfire the ways things often do when humans meddle with nature? Most scientists we interviewed, as it turns out, would be all right with saying goodbye to the species. Aedes aegypti carries other deadly diseases harmful to humans, like yellow fever and dengue. Animals don't depend on this species as a major food source, and the critters don't pollinate plants. And anyway, they're an invasive species, infiltrating our cities, where they thrive. So we asked experts: Do we have the means to get rid of a species of mosquito? And if they were in charge, how would they do it? In the past, there have been successful campaigns to eliminate disease-carrying mosquitoes from small regions. But even on a tiny scale, an incredible amount of political cooperation and strategic coordination was needed. Andrew Read, a biologist and entomologist who specializes in the ecology and evolutionary genetics of infectious disease at Pennsylvania State University, shares an example from a port town in northeastern Brazil. In the mid-1900s, the government organized an effort to fight malaria by eradicating Anopheles gambie from an area about the size of West Virginia. Not only was the government united in its goals, but it made sure to set up a careful plan to track progress. An official was in charge of a team that checked another team that checked the insecticide sprayers, says Read. They ended up spraying insecticide into a body of water the size of Switzerland. To take on Aedes aegypti in the six continents where it lives, we'd need a global mosquito czar. "Dictatorships are great things if you want to get public health done," says Read. "These days, people in Florida have lots of paranoia about anyone coming on to their property to control mosquitoes. But in the old days, people just rolled over and did whatever the government told them." So let's say that in a remarkable display of unity, all member nations of the U.N. agree to elect a mosquito czar and abide by the czar's decrees. What comes next? When it comes to reducing the diseases spread by mosquitoes, traditional control techniques can work wonders: spraying pesticides, protective clothing, bed nets and window screens, getting rid of standing water where mosquitoes tend to lay their eggs. Because of efforts like these, in 15 years annual malaria cases have fallen by 37 percent to 214 million cases last year. But mosquitoes are becoming increasingly resistant to insecticides in bed nets and bug sprays, and some insecticides can harm other species in the ecosystem. And in developing countries, it can be hard to find the resources and staff to clean up mosquito breeding grounds and to detect resistance. On top of it all, in today's world, mosquitoes can travel just as easily as humans do. Some mosquito eggs can survive up to six months without water — that's the case with Aedes aegypti. So all it takes is eggs in a plane, train or automobile to get mosquitoes from one region to another. 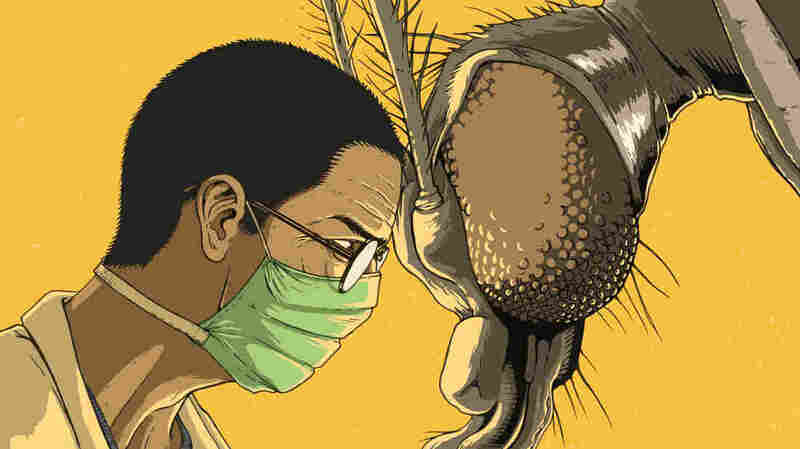 Read suggests that the best bet for getting rid of a species it to invest in high-tech solutions, all of which require using mutant versions of the mosquito itself. "These have more of a potential to lead to extinction," he says. We could try the sterile-male technique, which releases bioengineered mosquitoes that don't produce viable offspring into the wild and is already being tested in Brazil. Or the Wolbachia approach, which infects mosquitoes with a bacteria that can kill their offspring or reduce their ability to pass on viruses like dengue, he says. Or we could wait around a few years for a new technology called gene-drive systems — the technique of altering the genes of wild mosquitoes. Sometimes that involves turning off genes that foster egg production in female mosquitoes, so they lay no eggs. And no eggs will eventually mean no population. Other genetic alterations stop the mosquito from being able to transmit disease by introducing genes that cause resistance to the pathogen. A mosquito carrying Zika, for example, would be blocked from passing the disease on. Read thinks gene-drive systems are promising: "If you could get [gene-drive systems] to run, once you've let it go, it should spread and kill everything." A lot of money. To take any one of these techniques and scale it up for a worldwide campaign, Read estimates a $250-to-$500 million pricetag. That's a lot more than the $10 million or so that each of these techniques is currently working with. On the other hand, it's a relative bargain. To develop a vaccine for just one disease can cost up to $1 billion. And Aedes aegypti carries a handful of diseases like Zika, chikungunya, dengue and yellow fever. It would be a good investment. "Mosquito control stops people getting infected in the first place," Read says. "Drugs just end up given to those who are already sick." So let's say the world's billionaires foot the bill. Now what? Step 4: Ready, set, eliminate! Once this funding kicks in, Read imagines it would take about five to 10 years to plunge into action. That's how long it would take to get the technology as perfect as possible and to fast track safety, regulatory and environmental approvals from all the world's governments, assuming our czar wants to do things the right way. So we're now in the year 2026, give or take. Millions of genetically modified and Wolbachia-infected mosquitoes have been bred by scientists and tech companies. Now, how do we get them out into the world? The old-fashioned approach would work: load up thousands of trucks with containers filled with millions of mosquitoes and have those trucks drive through infested areas. Release mosquitoes. And hope for the best. For the Wolbachia and gene-drive mosquitoes, you'd just need to release them once. But the sterile-male mosquitoes may need to be released into the wild again and again, for as long as it takes, until the number of humans infected by disease-carrying mosquitoes is under control. Assuming everything goes to plan, Read says we could potentially eradicate a species from a region within a year, citing one example from Australia. In October 2014, the village of Townsville used the Wolbachia approach to fight dengue by releasing hundreds of thousands of dengue-resistant mosquitoes into the wild. The strain of Wolbachia that was used put a damper on the mosquitoes' ability to pass on diseases. In August 2015, the scientists were proud to share that for the first time in 15 years, the town didn't have any new outbreaks of dengue — until last month. The disease returned locally after a mosquito transmitted it from a person who came back to the area from Papua New Guinea with dengue. So Townsville holds a valuable lesson for our mosquito czar: If you want to get rid of the population for good, you should make sure to target every habitat. Even if we got through Steps 1 to 4, scientists aren't sure of the extent to which any of these interventions could actually work. A lot of challenges remain. The three approaches — Wolbachia, gene drive and sterile males — will depend on making sure that the mutant mosquitoes mate with all the wild ones. And that means hunting down and releasing GM mosquitoes in hard-to-reach places where wild Aedes aegypti populations live, like deep inside the rain forest or high up a mountain range. And not a major worry for the scientists, but something to think about: There's a small chance the gene-drive mosquitoes may not be able to make the distinction between species, and could potentially cross-breed with other harmless, non-disease-transmitting mosquitoes in the ecosystem and kill them. Depending on the species of mosquito affected, there could be unintended consequences in the food chain. We asked Jorge Rey, a professor at the Florida Medical Entomology Laboratory, about the likelihood of a "Say Farewell To Aedes Aegypti Forever" campaign in the near future. "I wouldn't count on it right now," he says. "I think we'd have a hard enough time eliminating some of the mosquitoes, much less of all of them." Others are more hopeful. "In theory, in the lab and in the field, it does look like GM mosquitoes would lead to a pretty big crash in the population," says David Magnus, director of Stanford University's Center for Biomedical Ethics. "It may not lead to extinction, but at least a fairly big crash." And if that were to happen, the mosquito czar would no doubt win the Nobel Prize for insect extermination.